Great Barn, Great Coxwell - Faringdon Community Website. 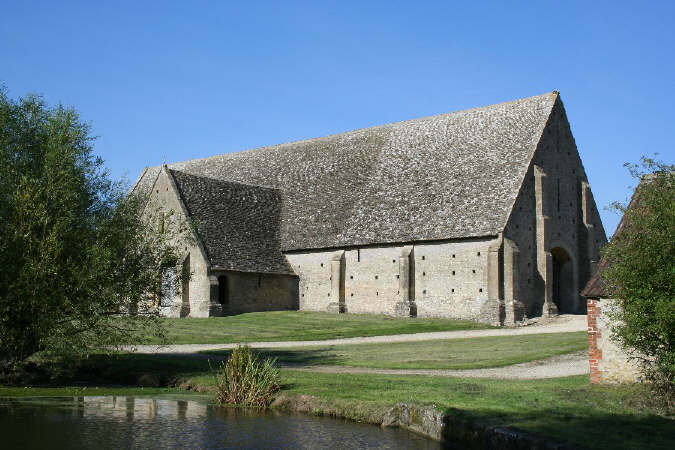 In 1204 the Manor of Faringdon was granted by King John to the Cistercian Abbey of Beaulieu, in Hampshire. A cell from Beaulieu was soon formed at Great Coxwell and the Great Barn is likely to have been completed by the middle of the 13th century, as the building of such barns was given high priority in the Cistercian Order. It remained under the control of Beaulieu until the Dissolution, when it passed into the hands of the Moore family. Little is known about its subsequent history, but it became the property of the Pleydell-Bouverie family and part of the Coleshill Estate in the 18th century. It was bequeathed to the National Trust in 1956 by Mr EE Cook, who had bought it in 1945. The site selected for the Barn is one of the very few in the area where there is stone not far below the ground surface. To conform to the contours of this site the axis runs almost from north and south instead of the more usual east and west. The walls are of roughly coursed Cotswold stone reinforced by ashlar faced buttresses. The roof consists of graded courses of Cotswold stone tiles. The dimensions are: length 152ft, width 44ft, height of ridge 48ft. The original doors are those on the east and west. Those in the end walls are 18th century and may have been built to accommodate the larger wagons and consequently larger loads resulting from improvements in the construction of the wheel. In the interior the structure of the roof supporting timbers is particularly interesting. The main load is carried by two rows of slender oak posts so successfully framed together that after 700 years of resisting pressure and thrust, not one has been dislodged from its original position. These posts rest on stone bases nearly 7ft in height. The bases are capped with oak templates laid sideways so that moisture will not rise from the stone into the fibres of the posts. The posts which are 22.5ft high are framed together 30ft above the floor cross-wise by tie beams then lengthwise by roof plates. The frame created in this way is strengthened at each corner by heavy bracing struts which reduce the unsupported span of the tie beams and roof plates to almost one third of their length. It is this design as well as solid foundations of the stonework that the system owes its lasting strength. All the principal posts and main and intermediate trusses are original. In 1868 four of the six tie beams were reinforced by bolting planks of deal against them and all the rafters, with the exception of those in the northernmost bay were renewed, also in deal. In 1961 and 1962 extensive repairs were carried out by the National Trust which included treatment against death watch beetle and woodworm, and the complete stripping and replacement of the stone tile roof. There was originally a Tallat loft in the upper part of the west porch. This was the accommodation of the monk in charge of the barn(grangerius). This loft was probably destroyed in the 18th century when the west door was bricked up and porch coverted into a stable. These additions were removed in 1962. Traces of the original board lining of the loft remain. There is a dovecot over the east door.